At FLOOR EXPERTS we present you the best laminate flooring brand AQUA-STEP for bathrooms. The most exposed places to water and moisture are our bathrooms and some people could never imagine having laminate in their bathrooms. But this is now possible and laminate will soon dominate over tiles -the most common flooring in bathrooms. The best laminate flooring brand you could ever imagine for your bathrooms is AQUA-STEP. You could actually place it wherever you want throughout your whole house if you have children and there is a lot of spilling this is the flooring for you. AQUA-STEP is the best laminate flooring for children. It is also the best laminate flooring brand for dogs and other animals because wet cleaning is allowed. It is 100% water resistant flooring and thus an appropriate option for your entire house. It is the best laminate flooring brand also for hotels, shops, offices and other places. 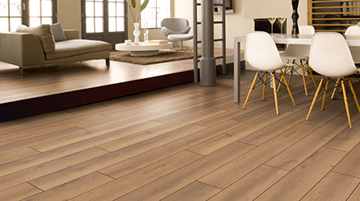 Look at our collection of best laminate flooring brands with low prices. Best laminate flooring for every taste is right here at FLOOR EXPERTS. A variety of laminate floorings such as COSMOFLOORITAN, LIFESTYLE, SWISS FLOOR, FRAND SELECTION, READY FIX, AQUA-STEP and other. Every collection has its own advantages. For example, not every laminate flooring is good for bathrooms and other places exposed to water and moisture. At FLOOR EXPERTS you will find the best laminate flooring for bathrooms. We suggest AQUA-STEP - the best laminate flooring brand for damp places because it is 100% water resistant.